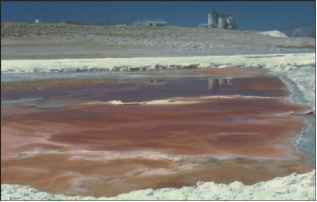 Figure 11.31 Typical Habital of Extreme Halophiles Solar Evaporation Ponds The red color is due to the pigments of halophilic organisms such as Halobacterium species. volcanic vents and fissures that exude sulfurous gases and other hot vapors. Because these regions are thought to closely mimic the environment of early earth, scientists are particularly interested in studying the prokaryotes that thrive there. Others are found in hydrothermal vents in the deep sea and hot springs. 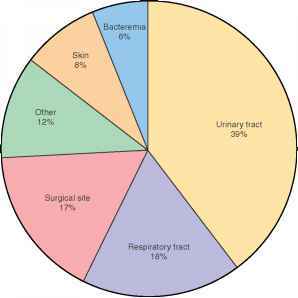 Recall that methanogens are archaea, but may live in anaerobic environments inhabited by a diverse assortment of bacteria. Some methanogens, however, are extreme thermophiles. Like the mesophilic methanogens, these organisms oxidize H2, using CO2 as a terminal electron acceptor, to yield methane. For example, Methanothermus species, which can grow in temperatures as high as 97°C, grow optimally at approximately 84°C. The sulfur- and sulfate-reducing hyperthermophiles are split between the Euryarchaeota and Crenarchaeota. They are obligate anaerobes that use sulfur or, in one case, sulfate as an electron acceptor, generating H2S. Members of the genera Thermococcus and Archaeoglobus are Euryarchaeota. Thermococcusspecies use organic compounds as an energy source and thrive in hot springs at temperatures of 90°C. Archaeoglobus species have an optimum growth temperature of approximately 80°C and have been isolated from near hydrothermal vents. They can use hydrogen gas and organic compounds as energy sources. 294 Chapter 11 The Diversity of Prokaryotic Organisms of one species is approximately 105°C, and it cannot grow below 82°C. Pyrodictium species preferentially grow in acidic conditions, with an optimum pH of approximately 5.5. Pyrolobus fumarii was found growing in a "black smoker" 3,650 m (about 12,000 feet) deep in the Atlantic Ocean. It grows between 90°C and 113°C. Sulfolobus species are found at the surface of acidic sulfur-containing hot springs such as many of those found in Yellowstone National Park (figure 11.32). They are obligate aerobes that oxidize sulfur compounds, using O2 as a terminal electron acceptor to generate sulfuric acid. They are thermoaci-dophilic, only growing above 50°C and at a pH between 1 and 6.